In the final (maybe) week (spin cycle) of Rhizomatic Learning (roots take hold), Dave (the instigator) asks us to consider (please) adding elements to a crowd-sourced Practical Guide to Rhizomatic Learning that will become sort of a legacy project for the community/network/crowd/swarm. I used a site called FlipHTML5 to create a flipbook version of the comic, which makes it easier to read. You can also see the full comic as a single page (it’s long) over at Flickr, too. I guess Dave will be pulling together people’s posts and artifacts into one ginormous GUIDE. That should be interesting, right? 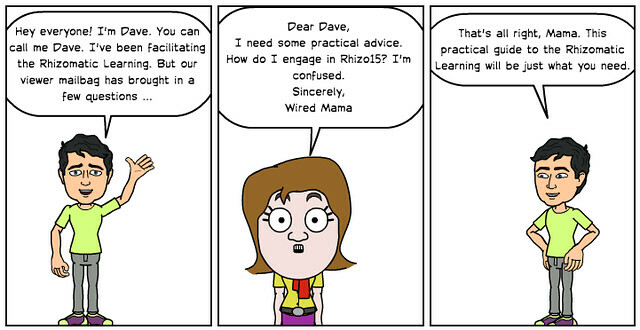 This entry was posted in comics, RhizoLearning and tagged rhizo15. Bookmark the permalink. Thanks for pullling together the unguide to #rhizo15. I don’t think any other is needed since I never really saw a practical view anywhere in evidence ;). Today’s anti-spam: amp suede, lay off of my amp suede shoes–this means you, Kevin.